Todd Kane of Oxford United in action during the EFL Sky Bet League 1 match between Oxford United and Plymouth Argyle at the Kassam Stadium, Oxford, England on 17 February 2018. Picture by Jason Brown. GK- David Marshall- The Scottish international has been their first choice goalkeeper this season and will keep his place between the sticks. RB- Eric Lichaj- He has been a solid player for the Tigers since his summer switch from Nottingham Forest. CB- Tommy Elphick- The Aston Villa loanee will be looking to tighten up City’s backline. CB- Reece Burke- Jordy de Wijs started against Wigan on Tuesday but I think Nigel Adkins will mix it up again against Reading and bring Burke back into the back four. LB- Stephen Kingsley- The ex-Swansea City defender has started every game in this campaign so far. RM- Jarrod Bowen- The 21-year-old has scored two in his last two games and will be hoping for another tomorrow. 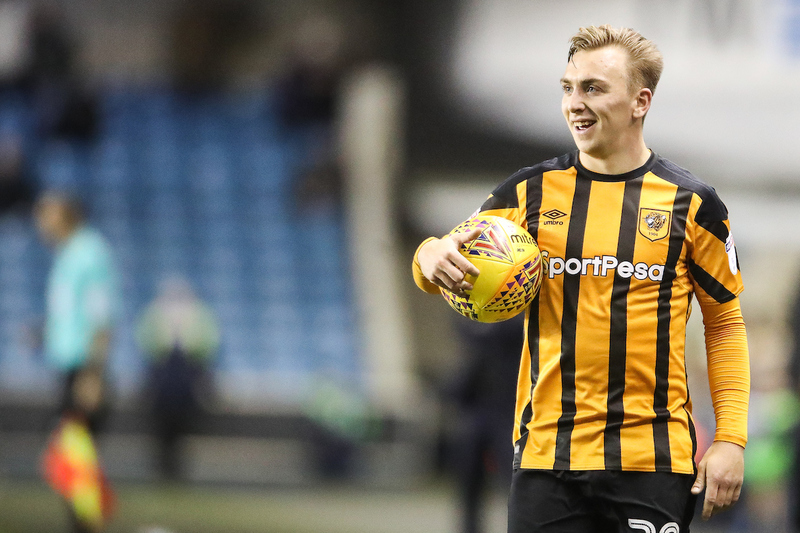 Jarrod Bowen of Hull City during the EFL Sky Bet Championship match between Millwall and Hull City at The Den, London, England on 21 November 2017. Photo by Toyin Oshodi. CM- Markus Henriksen- The Norwegian international, who is the captain of Adkins’ side, will keep his place in the starting XI. CM- Jackson Irvine- With Daniel Batty still out injured, Irvine is likely to start in central midfield ahead of Kevin Stewart. LM- Todd Kane- Kamil Grosicki and David Milinkovic are other options for left-midfield but Adkins will probably start Kane tomorrow. The Chelsea loanee will be fresh after being on the bench against Wigan. ST- Frazier Campbell- Adkins is likely to go for two up front again and Campbell, who was replaced by Nouha Dicko on Tuesday, could start. ST- Chris Martin- He will be looking for his first goal for the Tigers.